Remember those little "instruction" manuals that use to come inside every new toy you purchased? 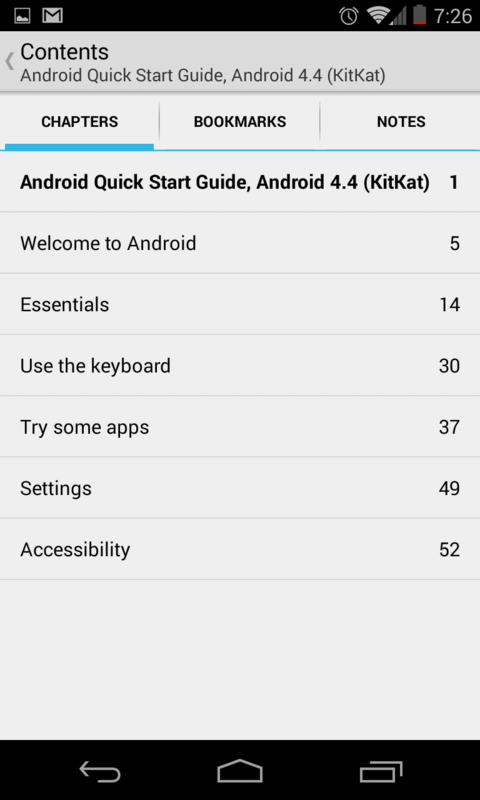 Well Google has done one better by publishing its first "Android Quick Start Guide, 4.4 KitKat" eBook. The 53-page eBook is perfect for those of you who have never picked up an Android device, and those of you who have been around since the G1 days. Offering a truly modern way to learn about the latest of Google's tasty treats, the eBook is free of charge and only requires a copy of Google Play Books to be installed before reading. Both the book application and the book can be installed via the Play Store. If you have problems installing the book on first go like I did, logging in via a web browser will quickly allow you to add it to your library. With the many new features available on KitKat, it is no wonder why Google decided to publish an elaborate manual about the update. The guide gives an overview of the features, including the new Tap and Pay system, wireless printing, and Chromecast support. Step-by-step guides will walk you through the process of setting up your Nexus and Google Play edition mobile devices, using the keyboard, interacting with Google Now, and much more. For other devices running 4.4, instructions might vary. Hardware details are not included in the manual. If you are upgrading to a Nexus 5 smartphone from a previous Nexus device, you may go through a slight learning curve. The way you navigate through the operating system has changed in some aspects and the guide will help you figure out the new way of doing things. Like any other eBook, the guide comes with a navigation menu allowing you to find what you need with the tap of a finger. You can also bookmark where you left off, and take notes of things you don't want to forget. According to the comments posted in the Play Store, the eBook is not yet available in Canada or the United Kingdom.